Inspiration Sounds Pure Live Breaks Vol. 1, Drum/Percussion Sample from Bandmateloops. 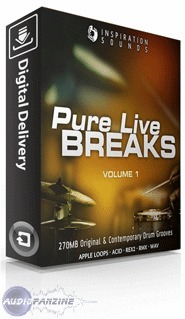 Pure Live Breaks Volume 1 features Original and Contemporary drumloops suitable for all production genres, says BandmateLoops. Inspiration Sounds' Pure Live Breaks Vol. 1 is a collection of original ‘rough and ready' drum grooves as performed by international session drummer Gary Widlake. Featuring over 240 drumloops ranging from 95-130bpm, Pure Live Breaks V1 is designed for Breakbeat, Pop, Rock, Hip-Hop, Funk, Soul, RnB and other music genres. Pure Live Breaks Vol. 1 includes both dry and processed (effected) versions of all loops for maximum flexibility.